This year I organized a cyclocross series in the interior with the support of Clifbar, Cycles Lambert and Oakley as well as many other fantastic local sponsors. 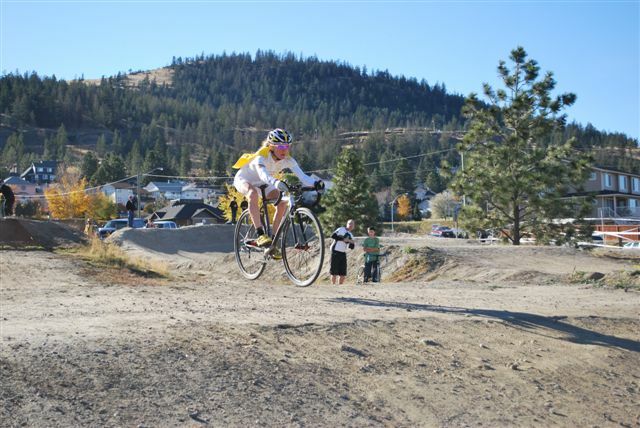 Penticton and Kelowna had fantastic organizers and I had little to do, but Kamloops was my baby. I figured this meant I should really do some cyclocross racing! So between making a cedar shed, starting an Anatomy and physiology course and organizing my Kamloops race Keith and I were booting it down to the coast for some cross racing. We hit up two BC cups, one being the infamous pumpkin cross where we got to get costumed up and jump over horse jumps. I got an email from Fox asking me if I wanted to go to Whistler to do some filming. Silly question! So between races and weddings and exams I was off to Whistler for a couple days of filming and relaxing with the Anthill film crew. We did some really neat shoots with Darcy swinging from overhead cables as I crisscrossed rock faces and Johnathan driving a truck while Collin filmed me "hopefully" shredding some trails. We had phenomenal weather and I was pretty pumped to be able to get in a bit of trail riding in whistler. Look for some fox and whistler tourism videos this spring. 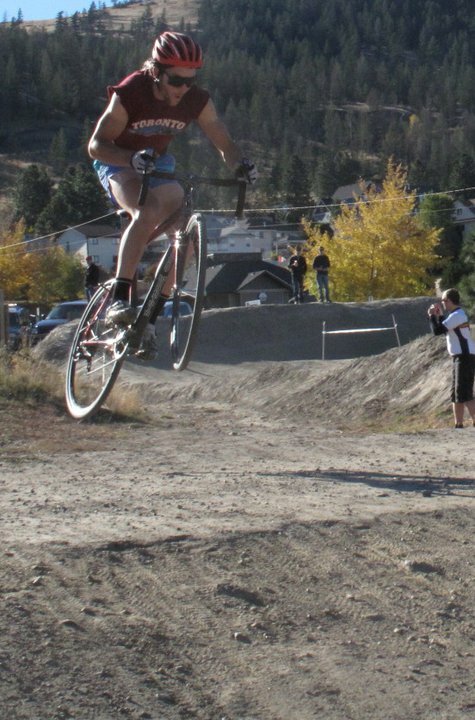 After Whistler, Pumpkin cross and 2 exams we were in the final days leading up to my cross race. I knew organizing a race would be a lot of work, but wasn't quite prepared for how much time and energy it would consume. My normal routine was constantly interrupted and I'll admit to losing a couple hours of sleep. Everything came together amazingly though, even the weather. I was blown away with how supportive the City of Kamloops was by meeting with me numerous times to choose a park, mark irrigation lines, paint lines etc. The local shops and riders were equally supportive giving prizes, racing and volunteering. Tons of racers came together to help set the course up Saturday afternoon. The local kids didn't tear it down overnight even though it was Saturday night and the next day was Halloween. We got 54 people out to race and tons wearing costumes. The racing was fast and entertaining (see the results page) over a BMX track and twisting through a park. Keith beat me and is now retiring from competition, at least against me. Evan gets more air than me. Definite style points and not only for the shorts. Afterwards everyone hung out to enjoy the beautiful day smoothies from pure cuisine and coffee from Juniper Market as I with my trusty sidekicks Cheryl and Bevin handed out the gingerbread cookie medals and about 40 prizes.